Overlooking the pristine white sands of Ras Al Khaimah’s tranquil Marjan Island, Rixos Bab Al Bahr is a majestic, luxury property that provides all-inclusive accommodation to its guests. This means that apart from all the modern amenities that guests are usually entitled to, they can also savour all the scrumptious dishes whipped up by the chefs of the hotel. To complete the family experience, there is a spa and wellness centre to pamper your body and soul, a kid’s club to keep your little ones busy, and numerous entertainment and leisure activities planned and organized by the hotel to make your trip a memorable one. The hotel itself is a majestic property spread over sprawling gardens, fountains and swimming pools. The well-appointed rooms are tastefully decorated and come with all the facilities a guest can hope for. 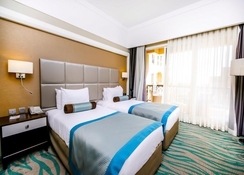 If you’re looking for a perfect family friendly accommodation option in Dubai, this classic beach hotel is the ideal choice that combines luxury with a casual charm, which gives it a unique vibe. 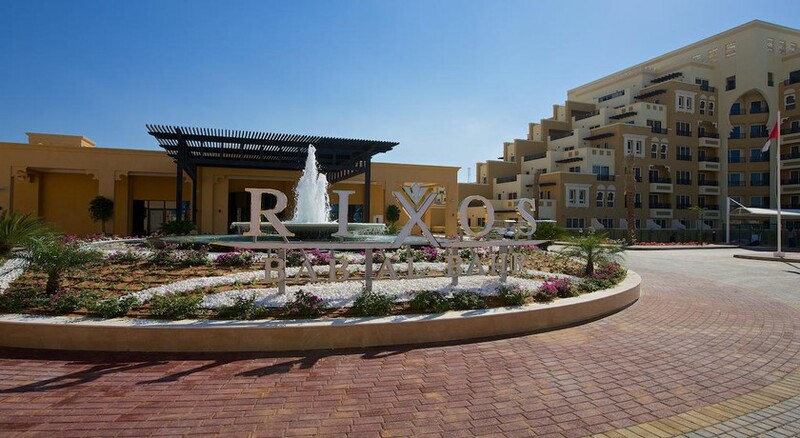 The 5-star Rixos Bab Al Bahr enjoys a great location near to the beach, but not too far away from the city centre. Ras Al Khaimah’s city centre lies 25km away. The resort’s water park attracts a lot of visitors where kids can have a splash-tastic day. A little further away (around 80km) is Dubai, while the Dubai international airport is only 70km from the hotel. 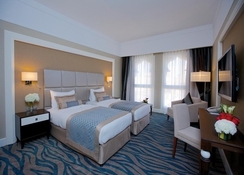 The hotel has a total of 650 rooms and suites overlooking the Arabian Gulf. Each room is decorated in shades of white, bronze and azure. The pyramid design of the resort ensures that you enjoy amazing views of the Arabian Gulf from all rooms and suites. 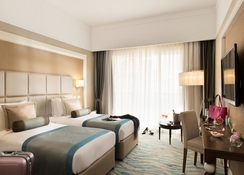 They come in a variety of categories, including Classic Room, Deluxe Room, Premium Room, Family Room, Junior Suite, Senior Suite and King Suite. Ranging from 32 square metres to 190 square metres, the rooms have expansive beds, flat-screen television sets, large windows with stunning views and en-suite bathrooms. Some of the suites come with attached terraces. The hotel is the perfect all-inclusive resort for families that allows its guests to eat to their heart’s content in one of its several restaurants. The world-class restaurants of the hotel include BBQ Restaurant for grilled delights, Seven Heights for lavish buffet spreads, Fish Bone for fresh seafood, Lalezar Restaurant for authentic Arabic cuisine, Meat Point for traditional Turkish delicacies, L’Olivo for hearty Italian meals, Aja Restaurant for exotic oriental dishes and Toast ‘n’ Burger for round-the-clock services. There are as many as seven bars to choose from including a pool bar, a lounge bar, a mojito bar, a cigar bar, a sea-side bar and a VIP bar. Rixos Bab Al Bahr has a great selection of entertainment and leisure activities specifically created for summer and winter months. While for winter months, when the weather is mild and cool, the activities are centred on the outdoors, the summer months are dedicated to indoor activities. The 345 metres-long private beach is the perfect place to bask in the sun, or if you want to take a dip in the waters, choose from the 4 outdoor pools and a kids’ pool. The spa and wellness centre, named Anjana, combines traditional Turkish practices and modern concepts of wellness. 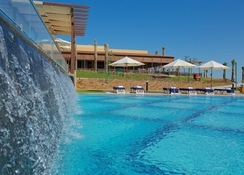 The centre has Turkish hammams, steam rooms, showers, private outdoor pools and so on. It provides a range of beauty and wellness packages customized for its visitors. The Rixy Kids Club, on the other hand, is the perfect place for yours kids to unwind and learn creative skills, while you are busy relaxing at the spa. The club caters to two age groups: 4-12 years and 10-17 years. The activities are specifically designed according to the tastes and interests of each group. Great location to relax, facilities brilliant and a range of food for various tastes. Situated about an hour from the city of Dubai unfortunately so only visited the once by taxi, as very expensive. If your looking for a hotel with everything under one roof then this is perfect. The only negative is the booking of the a la carte restaurants as many other travellers have commented on, it’s not the greatest system and means getting up, trying to book restaurants and finding there are no places available anyways...if you speak to office though they will help support and they are worth battling to try and get in. We went in August when the hotel was quiet as many people don’t visit due to the heat and I couldn’t imagine going when the hotel was at full capacity though. Would definitely go again in the quieter season.